This is for all fellow gardeners out there working to make their plot, whatever the size, beautiful. Here in the Surrey Hills it is typical April weather, showers and sunshine; just perfect for making the flowers grow and helping to create an English country garden. As I write this it is raining and the sky is dark grey, but in turn that makes all the fresh green foliage glow. 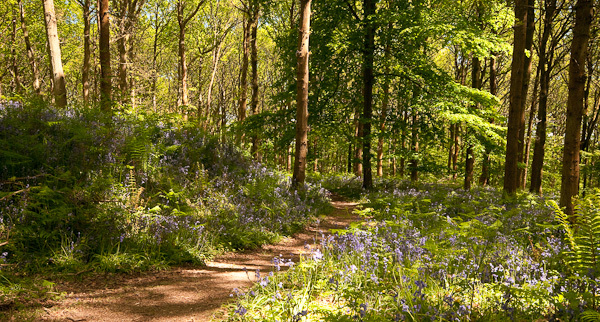 Likewise I know that the bluebell woods nearby will be getting ready to look their best – and the perfume of a bluebell wood, after a shower of rain, is something to be experienced. In celebration of Earth Day I give you a photo of my favourite bluebell wood. This entry was posted in Out of my garden and tagged bluebell wood, Earth Day, outdoors, rain, spring day, Surrey. Bookmark the permalink. 2 Responses to Happy Earth Day! I love your bluebell wood! I worked next to a bluebell wood once, near Theale in Berkshire. Was the reason I took the job, and it was worth it (especially as I moved up to London come summer time)!